August 8, 2011 – RAD Data Communications has expanded its unique System-on-an-SFP family with the addition of the new SFP-ER, a miniature Ethernet extender that delivers 100 Mbps of Ethernet up to 550m (1,804 ft) over existing copper wires (4-pair). Housed in a Small Factor Pluggable (SFP) enclosure, the finger-sized SFP-ER is easily attached to any Ethernet switch with an MSA-compatible 100 Mbps TX Serdes. 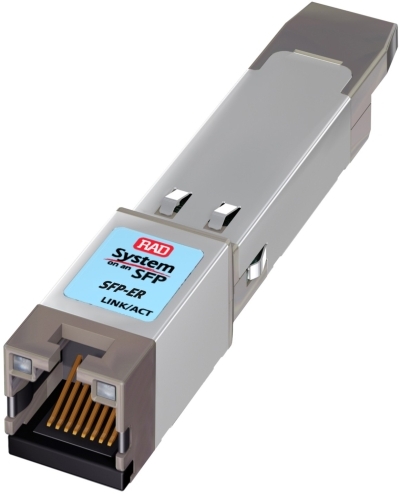 “The SFP-ER will prove to be a welcome tool for system integrators, service providers and campus network managers because it lets them use the existing copper infrastructure for high-speed Ethernet while eliminating the expense of laying new fiber,” states Jacky Acoca, Global Business Manager for Smart SFPs at RAD Data Communications.